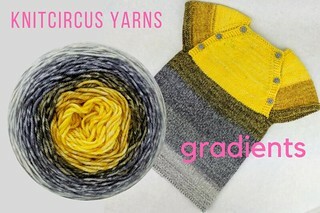 At Knitcircus, we’re wild about creating self-striping yarns and can’t stop coming up with gradient colorways. Each cake includes six different shades; just knit along and watch the colors change! One ball makes an enchanting baby sweater like the Spring Break project in the Brass and Steam gradient shown, or choose a larger one for a Hitchhiker or your favorite shawl. Mix and match with gradients, coordinating Speckled Handpaints and semi-solid yarns for the perfect match for any project. Visit us online at Knitcircus.com or in person at our Studio Store. 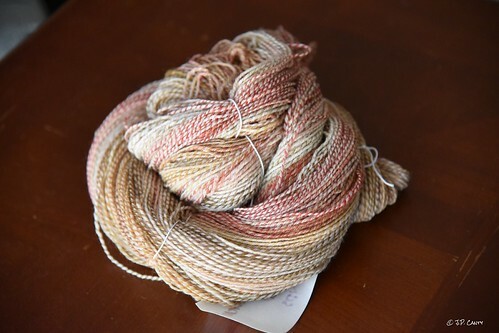 All Knitcircus yarns use luxury USA Merino bases and are hand-dyed with love in Wisconsin. Jasmin did a live knit and chat on instagram live with BostonJen from the Down Cellar Studio Podcast. Gigi picked up her Purlbreak again. She mentions Sock School. Jasmin mentions Pawley mugs. Gigi is working on a Welcome Blanket, her colors are two shades of purple, and two shades of green. She cast on a new purple square and finished it, cast on another one. Jasmin has split for the armholes on her Boxy out of Neighborhood Fiber Co’s Studio worsted in the “Parkland” colorway. Jasmin has started her #ChooseYourOwnAdventureKAL, the Fading Lines by Joji Locatelli. She is LOVING Knit Companion. in Cadet Blue. Gigi is considering swapping the needles out, so she can work on sock rockets instead. Jasmin mentions Lucy Neatby's DVD series. Jasmin mentions Joanna Johnson and Brenda Patipa. called “Did You Loose Count?”) with Nicole Frost last Thursday night. She’s been plying up a storm. Setting yarn: all at the same time? Also, whom would you like to see on an episode of "Did You Lose Count?" Gigi mended Genevieve‘s dress with Battenberg lace. Mended small holes in a commercial sweater. Not decorative mending. Tried using hair for mending. Hammersen and her blog. Gigi mention DMC embroidery floss. Storage bins and art bins. Together with Genevieve they assembled a pattern from Made for Mermaids.